Chinese silver vase, circa 1900. Classical Amphora with domed foot, concave neck, and flared mouth. Branch-style scroll handles mounted to neck. Oval frames with bamboo, blossoming prunus branches, and perched birds including one severe owl. Leaf-and-dart at base. Marked with Chinese characters. Weight: 31 troy ounces. 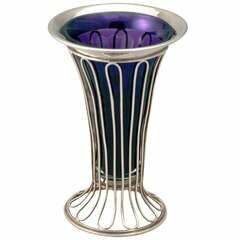 Silver vase with unique arched wire design and rare purple glass liner. Hallmarked: Birmingham, 1907. 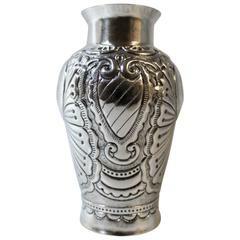 By Waterhouse, Hodgson & Co.
Beautiful vase in sterling silver completely handmade with chiseled strips. The round body ends with the upper part which is narrow and decorated with 2 cast fish 1,020 grams. 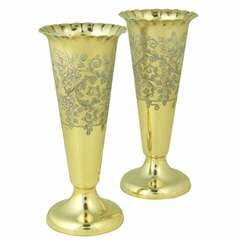 Antique American sterling silver trumpet vase, circa 1920. Beautiful Peruvian 900 silver vase. Weight 199.6 grams.